It’s barely a week since we had Maxis’ latest SimCity updated with an offline mode, something we’ve been asking for since it launched, and another always-online SimCity has popped up. This one’s a little more understandable, though. 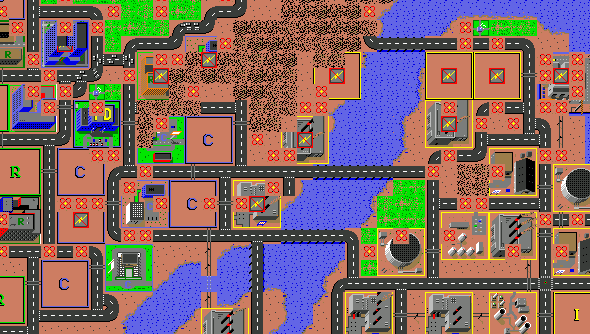 It’s a remake of the original 1989 SimCity that you can now play in your browser. I’ve been playing it all afternoon and I’m a rubbish mayor. Everything seems to be going great for a short while – my residential districts are densely packed with citizens, my industrial sites are thrumming with the sound of cheap labour, and my commercial sector is booming. Then, almost in unison, all three facets of city collapse and I go bankrupt. I reckon it’s a conspiracy, there’s dissent in my city’s ranks. It’s those 99%, fighting for equal rights and liberal wishwash. Well, I’ll let them stew, leave the game running so their trapped in their rundown broken city. You too can join in the despotic fun times but clicking this link and being transported to MicropolisJS. Unfortunately there’s been little visible change to the game since then. Still, in it’s current form it’s a good afternoon lark.